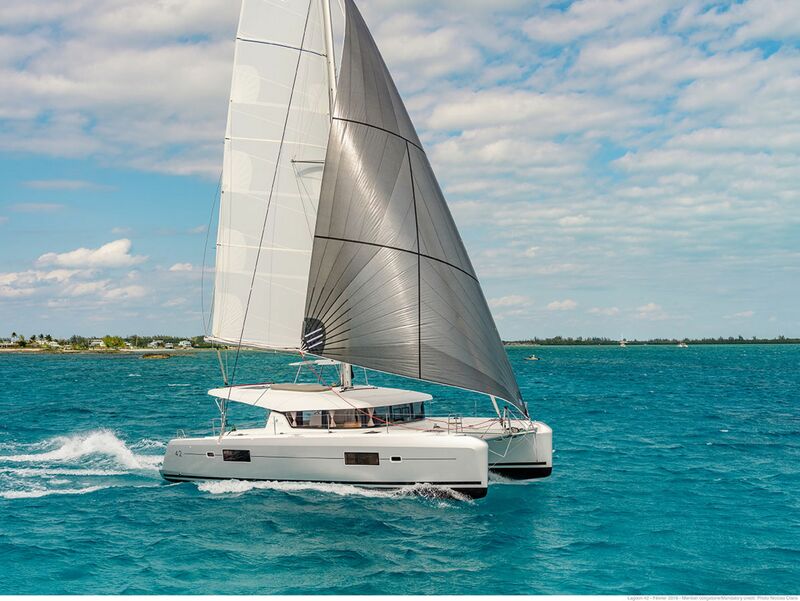 Lagoon is the world’s number one catamaran manufacturer. SMART Boating is delighted to announce the continued expansion of our syndicate boat fleet with a brand-new Lagoon 42 to be based in TWO magnificent locations. 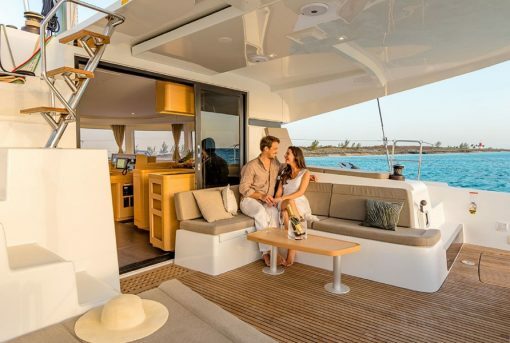 These fabulous boats are loved by their passionate owners – and it’s no wonder! 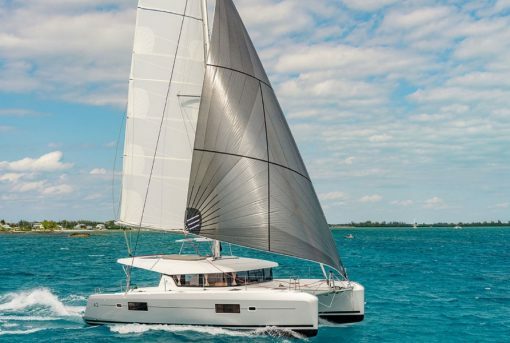 Lagoon’s unique expertise in innovative catamaran design makes it the world’s number one catamaran manufacturer. 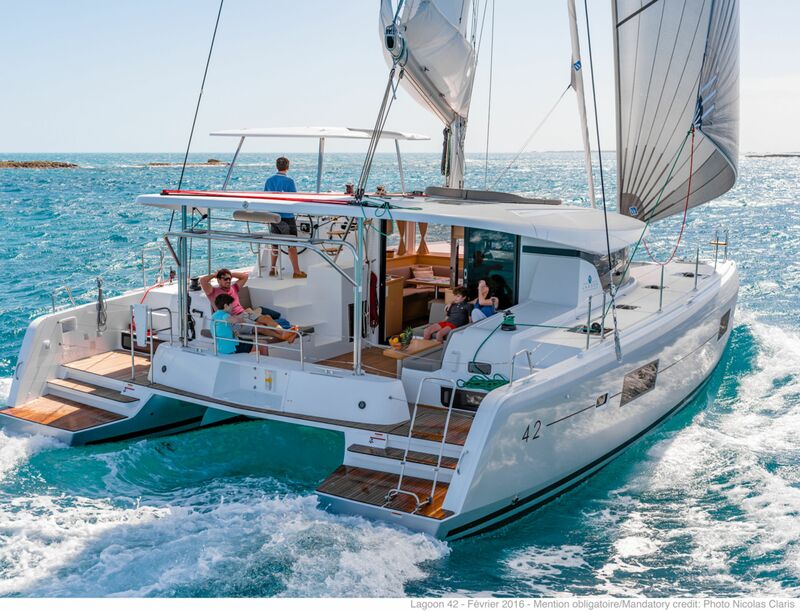 SMART Boating’s new Lagoon 42 arrives in November 2018, but if you order now you’ll save with special pre-delivery pricing*. 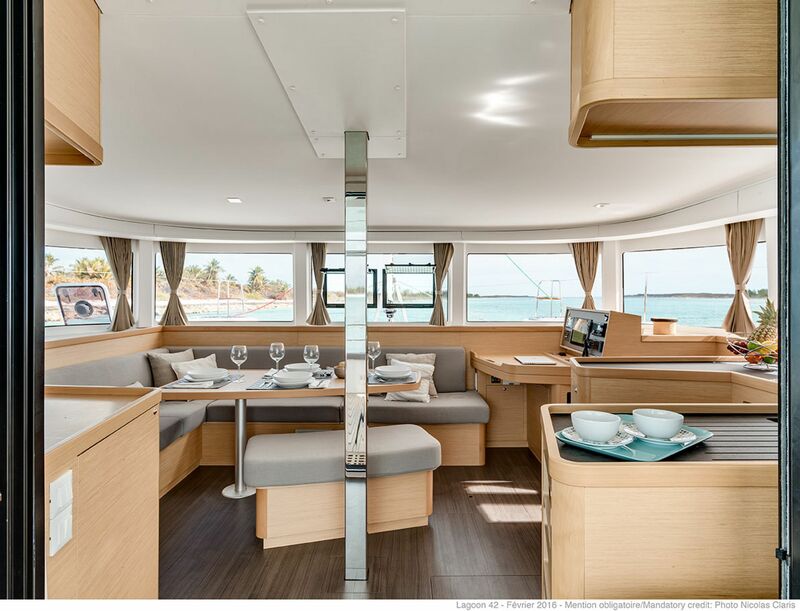 From November to June, she’ll be based at beautiful Pittwater, and then your Lagoon will seamlessly move to the excellent marina facilities at Hamilton Island, where she will be based from July to October, in the heart of the spectacular Whitsunday Islands. 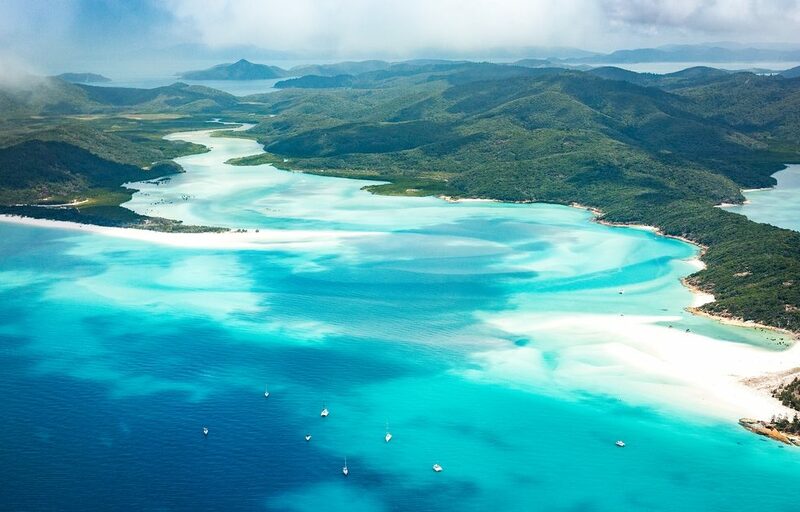 Simply fly direct to the excellent marina facilities at Hamilton Island, which lies at the heart of this stunning sailing paradise, and within minutes you can be on board your Lagoon 42, which will be cleaned, fuelled, ready to board and sail away. 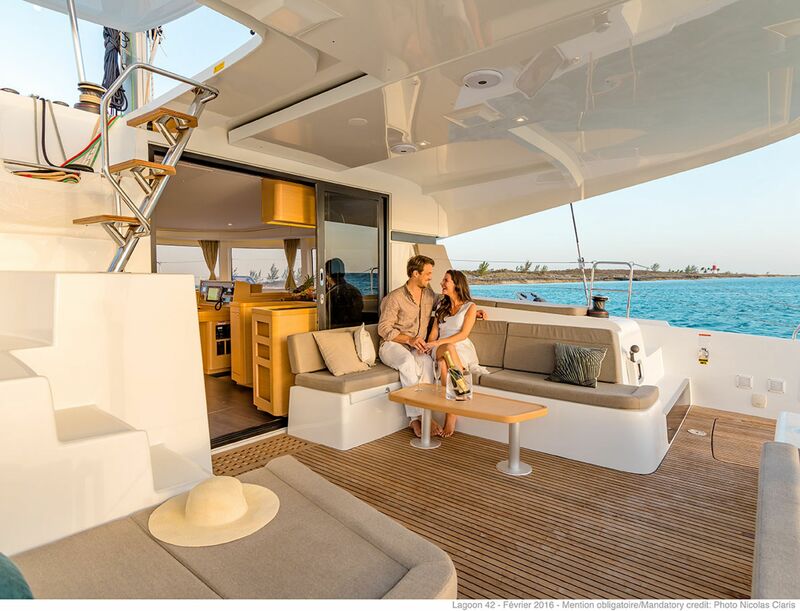 No need for a boat briefing as you would with chartering – simply stow your gear, provisions and sail away. 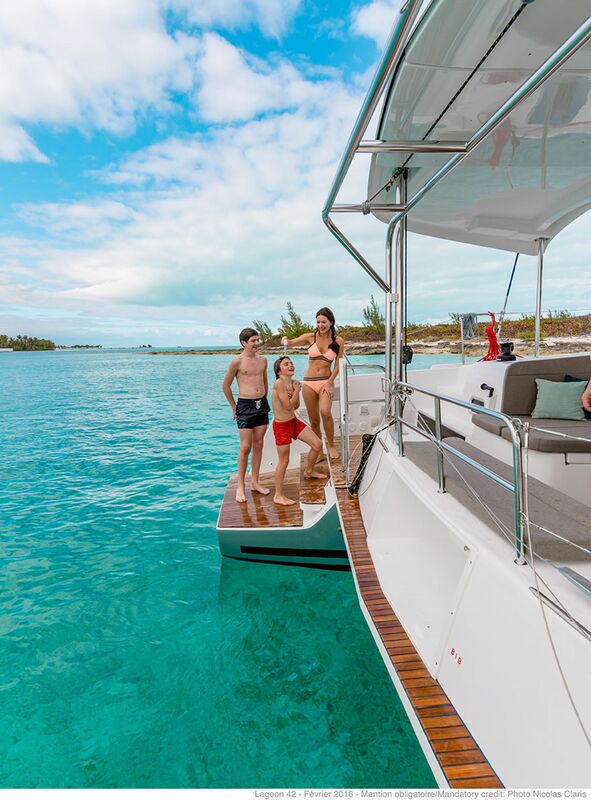 Whether you’ve come to sail, dive or simply relax, once your holiday in this spectacular cruising ground comes to an end, simply pack up and head home – no fuss, no hassle, no cleaning, no nothing! SMART Boating takes care of it all. And of course, when Sydney starts to warm up again in November, your Lagoon returns to Pittwater for the summer season. Now that is SMART BOATING! 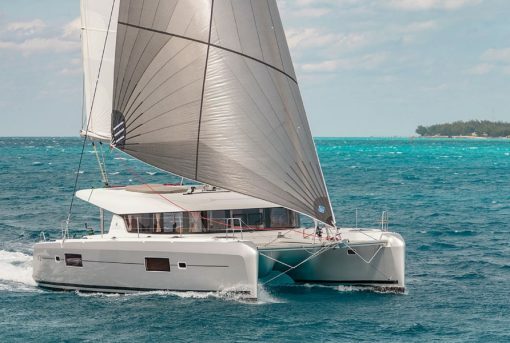 The Lagoon 42 offers easy, comfortable yet speedy sailing with that extra capacity and those additional features we have come to expect from the global leaders in catamaran manufacture. This boat is comprehensively equipped inside and out. 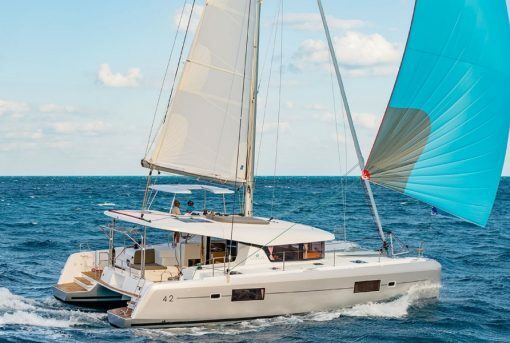 She is the perfect live-aboard model, offering four cabins each with their own ensuite bathroom. 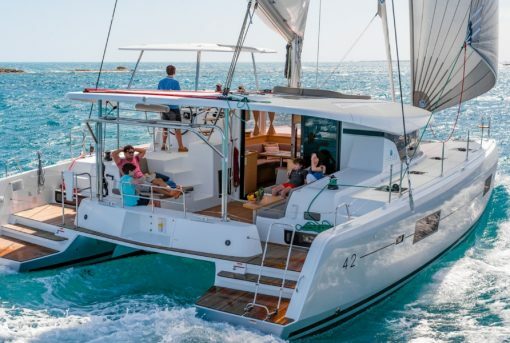 The Lagoon 42 is built with weight saving in mind. The hull, deck and bulkheads are infusion moulded. With less buoyancy required forward, the bows are finer, improving the wave piercing power. The raised steering station gives you a panoramic view, yet you’re well protected. 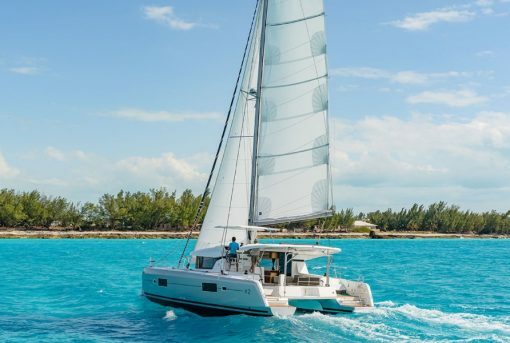 And with all controls within easy reach … this is an easy catamaran to sail. The saloon blends with the cockpit when the door and sliding saloon window are open – but you can close them anytime. As with all Lagoons, there’s heaps of space for relaxing and entertaining. The vertical windows optimise space and light yet maximise protection from the sun. Interior woodwork is Alpi – a beautiful lightweight composite material. 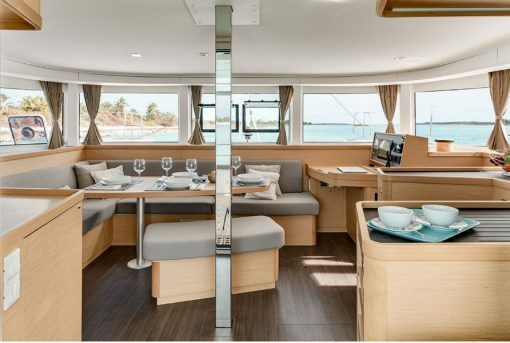 The aft cabins boast island double beds and benefit from a bathroom with separate shower. Forward cabins have side access beds and an ensuite combined head and shower. 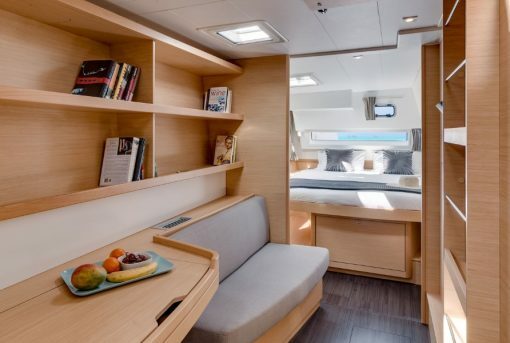 A U-shaped galley affords extensive storage space and wide work surfaces and is oriented towards the external cockpit, making entertaining a breeze. A 10% ownership share costs $109,500* special pre-delivery price with a monthly maintenance fee of $798 + fuel. 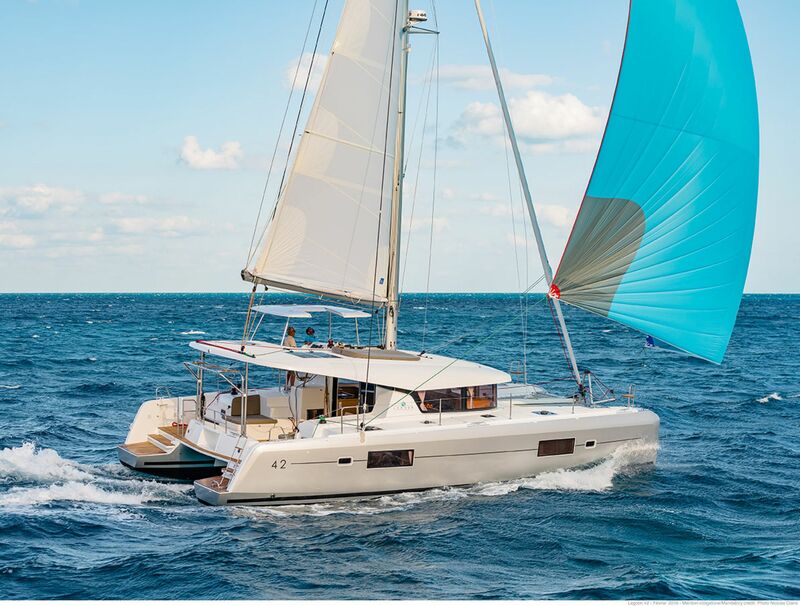 *SMART Boating’s Lagoon 42 arrives in November 2018 but if you confirm your share now, you’ll save with special pre-delivery pricing. The cost of diesel fuel used is extra and is charged based on engine hours used. 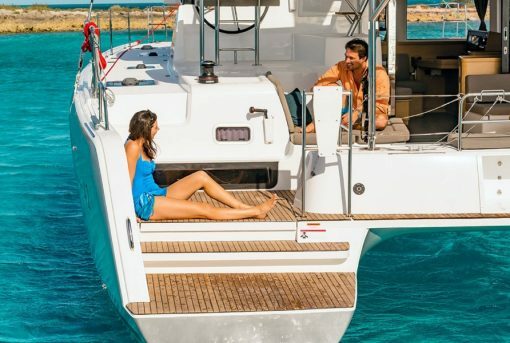 This SMART BOATING syndicate runs for five years, after which time the boat will be sold and all owners receive an equal share of the net sale price. If you want or need to exit the syndicate early there is no penalty and we can even help facilitate the sale of your share. 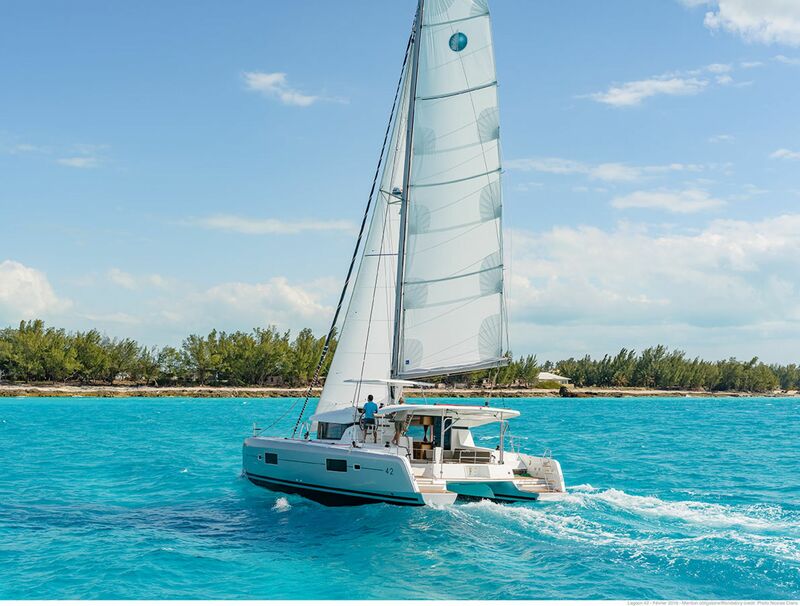 You can read about an existing Lagoon catamaran SMART Boating boat share experience here. For more details, complete the enquiry form or call Martin on 0419 265 273 or David on 0418 211 832. Or if you are ready to proceed now, you can download an application form here.